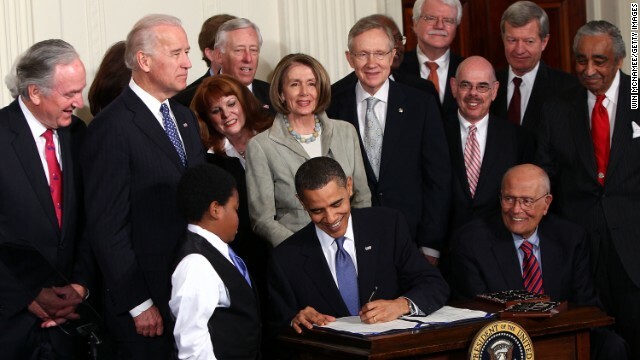 (CNN) – The Affordable Care Act, enacted in 2010 but still the focus of intense Republican scorn, will get a boost from its champion President Barack Obama on Friday at an event singling out the law's benefits for women. His remarks, to be delivered at the White House, will be made alongside women and families the White House says are already benefiting from the measure, which has become known as Obamacare. The event is pegged to Mother's Day. "Mothers are the Number One validator for the young and uninsured and will be critical in the effort to encourage their kids to enroll for insurance in the fall," a White House official said. "The audience for the event is comprised of representatives from women's organizations that will help amplify the benefits of the ACA for women and help us communicate with millions of women the benefits that are now available to them and their families." Those benefits include better access to mammograms and birth control, as well as new measures allowing children to remain on their parents' health insurance up to age 26, the White House said. The health care law, considered one of Obama's most substantial first-term achievements, has long been challenged by Republicans as unconstitutional and bad for small businesses. The Supreme Court heard challenges to the law last year and upheld it by a 5-4 vote, deeming its key individual mandate, which requires most Americans to obtain health insurance or face a tax penalty, constitutional. That decision also paved the way for the law to take effect next year. Yet, Republicans have vowed to continue fighting the law. The House will hold its 37th vote to repeal Obamacare next week, though its demise is unlikely with a Democrat-controlled Senate and White House. "We've got 70 new members that have not had the opportunity to vote on the president's health care law. Frankly, they've been asking for an opportunity to vote on it and we're going to give it to them," House Speaker John Boehner said at his weekly press conference on Thursday. "I want to repeal the law of the land." Some GOP governors have also opposed the law's expansion of Medicaid, refusing federal dollars to implement the expansion in their states. But Republicans aren't the only ones who have problems with Obamacare – Sen. Max Baucus, a key Democrat who helped craft the law, voiced serious concerns in April about its rollout. "The administration's public information campaign on the benefits of the Affordable Care Act deserves a failing grade. You need to fix this," Baucus told Health and Human Services Secretary Kathleen Sebelius at a hearing last month. "I just see a huge train wreck coming down," he added later. The administration has been open to making the law easier to implement, including shortening applications for health insurance on government-run exchanges from 21 pages to three. Recent polls show Americans are as split as Washington over the law. A January CNN/ORC survey showed that 51% favor most or all of the proposals while 44% oppose most or all elements of the law. Those numbers are reversed from 2011, when only 45% were in favor and 51% opposed. 51% now approve. People are waking up. Fight this law until it is dead in the ground! jkane sfl the gop national disgrace party will be swept out like the trash they are in2014 ? Well the gop is the focus of intense scorn from most of the country and they will see it clearly after the 2014 mid terms .Obama care pass both houses of congress and the supreme court . Who care if the gop morons don't like it ,to bad they listen to their own bs and propaganda and all the southern brain dead gop states will have to play catch up and pay more in the end while their voters get sub standard health care, bachmann ,head moron. The gop is to stupid to govern,maybe in somila . Ahh yes – jobs, healthcare, 20 milllion illegals; a quick-fire recipe for the demise of the nation! I don't see Mark Sanford next to Nancy ? "President to tout Obamacare benefits"
And do his best to conceal the trillions of bucks it's going to cost. That's a form of lying. Whole bunch of people are benefiting from this law–pathetic idiots of GOP can not comprehend nor admit this truth. Mr. President, don't forget to wear a train conductor's hat. Also, please mention the number of people who have already had their work hours reduced to 29 instead of full-time because of Obamacare. Thank you. Obamacare, nothing more than a reason to raise taxes more than any other President in the history of the United States. It might be a good thing if the fine was removed and enforcement to pay for the service. Oh wait that's the way it is right now and the losers still can't pay their way for medical service. Reason everyone is split is the fact we were promised it was only going to cost 500 billion but now just under 3 months its up to over 700 billion. My question is where will it stop and what happens when they run out of money? Heres another point Obamacare is so restrictive that you cantt get a doctor to see you under it. If doctors will not accept the insurance then what good is it? Let everyone know it now will cost 1.8 trillion from 900 billion and has anyone read the bill yet. From what I see it's a train wreck waiting to happen all because it was passed and nobody ever read the bill you can't fix stupid vothe the bums out of office and take our Country back. If it is good enough for the American people, it is good enough for congress and the White House. Executive Order that! This is an example of the market needing a correction. Whoever said that the market can correct itself is full of it because it won't do that in most cases. 37 votes to repeal the PPACA, what a waste of time and money. The PPACA has already proved how it can save money on health care spending. Since its inception it has been a factor in reducing the yearly double digit rise of healthcare costs to 3 percent. This in turn greatly assists with the fastest deficit reduction since WW2 by lowering the costs of medicare/medicaid and increasing tax revenue. Imagine that, universal healthcare and taming the deficit. President Obama is such a contrast of competence from GWB. How heartless can one be not to want a fellow human being to have medical care? This is a mess we can't afford and do not want. What do we need to do so Washington hears? They don't read the blogs or this would not even be an issue. Tens of millions of premium jacked, exchange dumped, tax hiked, individual mandated, cut to 29 hours voters will blow Democrats' hair back next year. Obamacare "benefits" have increased my cost 30%. I guess it "benefits" someone else. When ObamaCare goes into effect next year, we all lose.